Orcas are the most intelligent and most dangerous predators of the oceans – and it is probably this combination making it such a fascinating and impressive thing to watch them in the wild. People just automatically experience an insane amount of respect for them. Except the humans, orcas don’t have any natural enemies, nowhere. 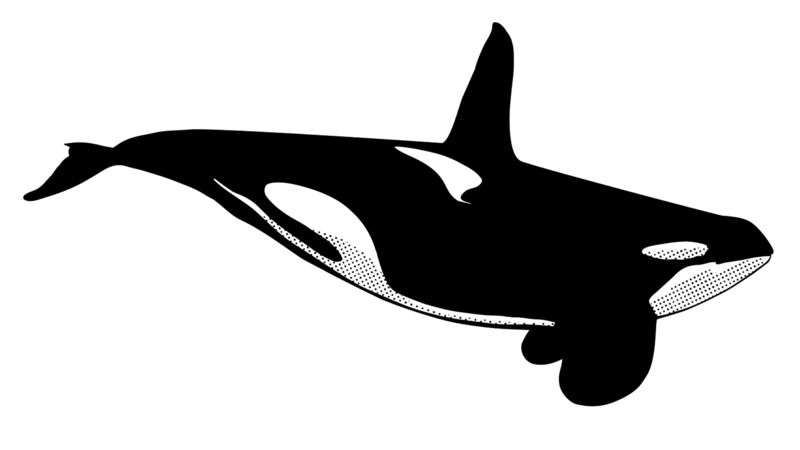 Orcas are the top predators of the oceans and are at the top of the food chain. Worldwide. If the Arctic ice continues melting and, thus, forces the polar bears to spend more time in the water, orcas could even pose a risk to them, the biggest and strongest land-based predators. It is due to the early whalers that orcas are also known as “killer whales”. Because, supposedly, they attacked and killed all other animals, even the biggest whales. Even the whalers were afraid of them. But actually, they were accused wrongly because not a single attack on a human has ever been documented in the wild. It seems that they only become dangerous for humans when they are separated from their family and caged in an aquarium for years and years. Orcas live closely together in families that stay together all life: children, grandkids, grandparents, aunts. These families are called pods or schools of whales. From time to time, several pods that are related to each other meet and form big groups (clans) of up to 150 animals. These clans even develop their own dialect and hunting habits by which they can be clearly differentiated. In Norway and Iceland, Orcas herd together large schools of fish into a big sphere and encircle them or enclose them within a wall of air bubbles. Then, they stun individual fishes with a strike of their fluke and pick them out. Several orcas in North America have specialized on seals and sea lions which they sometimes throw up in the air with their fluke like a tennis ball. In South America, orcas deliberately strand on the shores in order to catch young sea lions at the beach that are hidden behind the surf and, after that, they wait for the next wave to get back into the ocean. In polar regions, you can observe how orcas break up ice floes that they spotted sea lions or penguins on. If the ice floe is small enough, several orcas will swim right next to it in a group, then submerge in a controlled manner creating a bow wave flushing down the victim. It has also been observed how young orcas repeated this technique several times and always let their prey escape back onto the floe – deliberately, as it seems, in order to work on their technique. However, on the hunt for big whales, orcas act like a pack of wolves: rushing their prey until it is exhausted, attacking it from all sides and preventing the whale from submerging into the deep and from taking breath on the top, too. At the shores of California, attacks even on great white sharks have been observed – with no chance at all for the sharks: Orcas attacked in a coordinated manner from several directions and stunned the shark with targeted strokes of their flutes. The fight only lasted a few seconds. Males are recognizable by their huge upright dorsal fin. With the females, the fin is clearly smaller and slightly curved. The several distinctive hunting strategies and dialects are different from clan to clan and will be passed to the family’s next generation – which you can definitely label as a sort of culture. In British Columbia, Canada, it has been found that there are migratory and non-migratory populations (residents and transients) and, miles from the shore, there seems to be even a third group (offshores). These groups are very different from each other. Residents migrate on routes that are more or less predictable, live together in large groups, are a lot more communicative and mostly eat fish. Transients tend to travel long distances on routes that are in no way predictable, live together in small groups, are less communicative and mostly eat small mammals. Until now, very little is known about offshores. Orcas are communicative, sociable and intelligent animals – that even are able to recognize themselves in the mirror and, thus, definitely possess a form of self-awareness. And, good to know: Orcas actually belong to the dolphin family – only because of their seize they are mostly called “whales”. Males between 5 and 9 meters, females between 4 and 7 meters. Weight is about 10 tons. Black. White spot above the eye, grey-white spot beneath the fin, white bottom. Heavy, massive body with a high fin and paddle-like flippers. The tale is rather slim. Low, bushy blow (1 to 2 meters), not always easy to see but clearly audible. Huge fin, up to 2 meters for males, located centrally and sitting up right. Females’ fins are a bit smaller and spiky. Top side black, bottom side light to white. Curved convex, with a distinct notch in the middle. 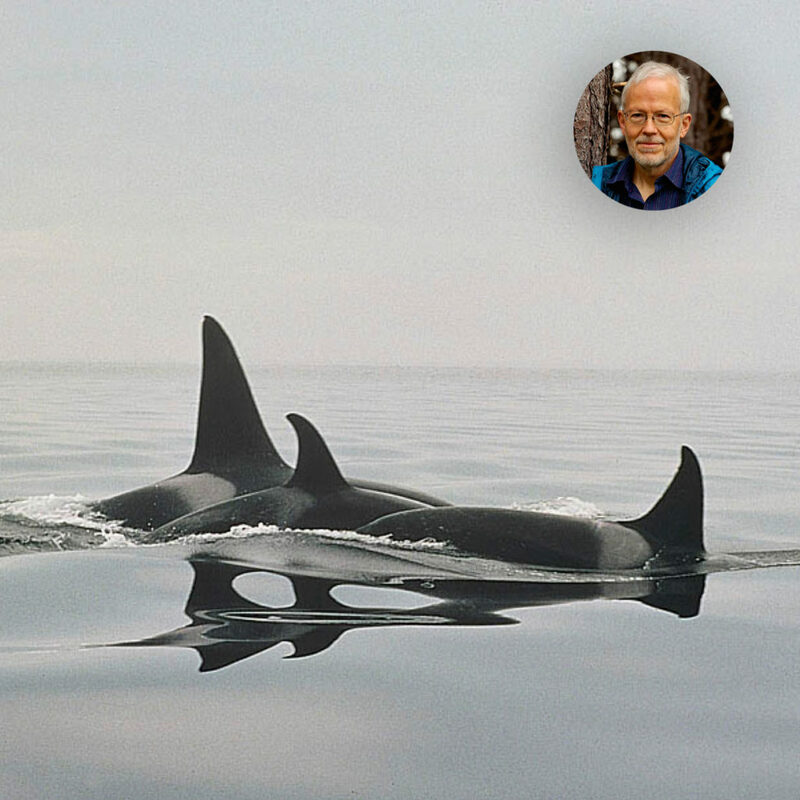 Orcas are curious, jumping and peeking out of the water often. They like to approach boats and occasionally follow them. Short diving times, only 1 to 3 minutes for most of the time, continuously near to the water surface. Orcas live in all of the world’s oceans. There are about 50 000 animals worldwide. Orcas often form schools (pods) of up to 25 animals. Often, they are highly active at the water surface. When traveling, orcas reach a speed of about 10 km/h. On the hunt, they are notably faster. Top speeds of up to 54 km/h have been measured. For whale watching, the non-migratory populations are particularly interesting: Residents mostly form pods of 5 up to 25 individuals. Their diving sequences usually follow a similar pattern: They dive 3 to 4 times with an interval of 10 to 30 seconds, followed by a longer diving sequence of about 3 to 4 minutes. Their routes are easily predictable. On the contrary, transients travel in smaller groups and tend to spend up to 15 minutes underneath the water surface. Furthermore, they often change direction, making it difficult to predict where there are going to come up on surface again. Orcas are often very active at the surface, breaches and spy shops can often be observed especially with the residents. Both adults and young animals jump frequently, making an elegant, sideward jump and lifting their whole body out of the water. Then, they land with a loud splash on their back, belly or side. Also, spy hopping can be observed quite frequently. In doing so, the orcas get out of the water so far that even their flippers become visible. Often, several individuals are spying at the same time. And they have a pretty good sight – rule of thumb: when you can see them, they can see you. By the shape and size of the fin, the color pattern on the back and the composition of the group it’s possible to identify different families and individuals, at least for an experienced guide. Even though orcas live in all of the world’s oceans, there are only a few places where you can reliably observe them. Orcas live in all of the world’s oceans and belong to the most widely spread mammals of the world. However, they prefer the cold, polar regions to sub-/tropical waters. The traveling routes of the residents are easily predictable, whereas the routes of the transients are still pretty unknown. In winter, chances to observe them are great in the north of Norway (from Tromsø up north) when large numbers of herring gathers in the fjords. From November until February you have great chances to encounter a lot of residents. 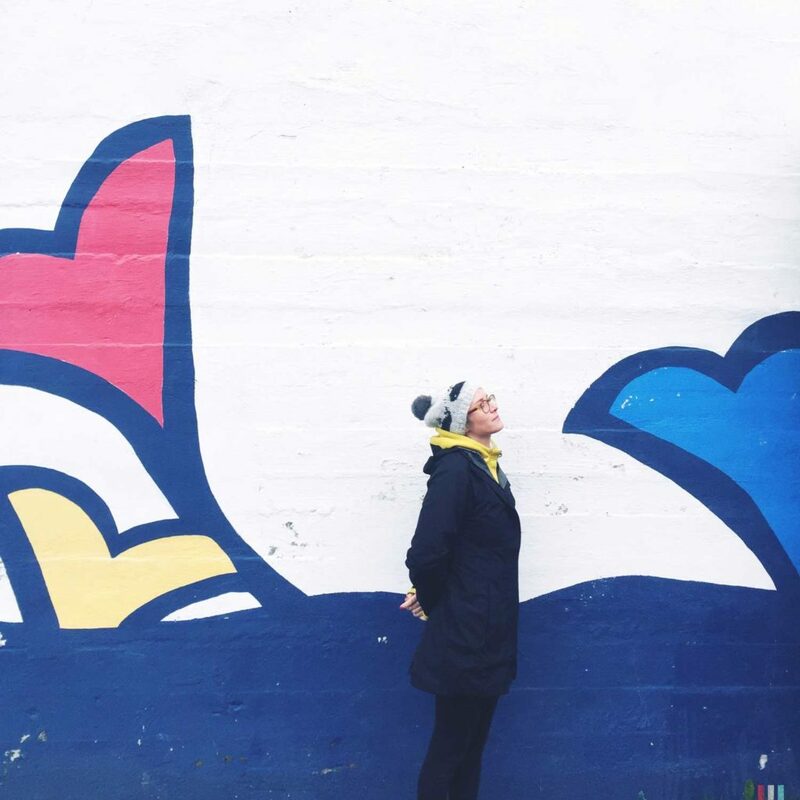 At the beginning of spring, the herrings start to spread into all different directions – and so do the orcas. Another option is Andenes with some pods of orcas preferring seals instead of herring. In summer, chances to observe orcas are best at the shores of Washington and British Columbia, particularly in the north of Vancouver Island and at the Strait of Georgia where the residents are following the salmon. But very little is known yet about where they spend the winter. At the North American West coasts, you also have great chances to observe the transients on their hunt for seals. In Iceland, orcas can be observed both during summer and winter but chances are not as reliable as in Norway and North America. Another very good option is the Street of Gibraltar during summer. 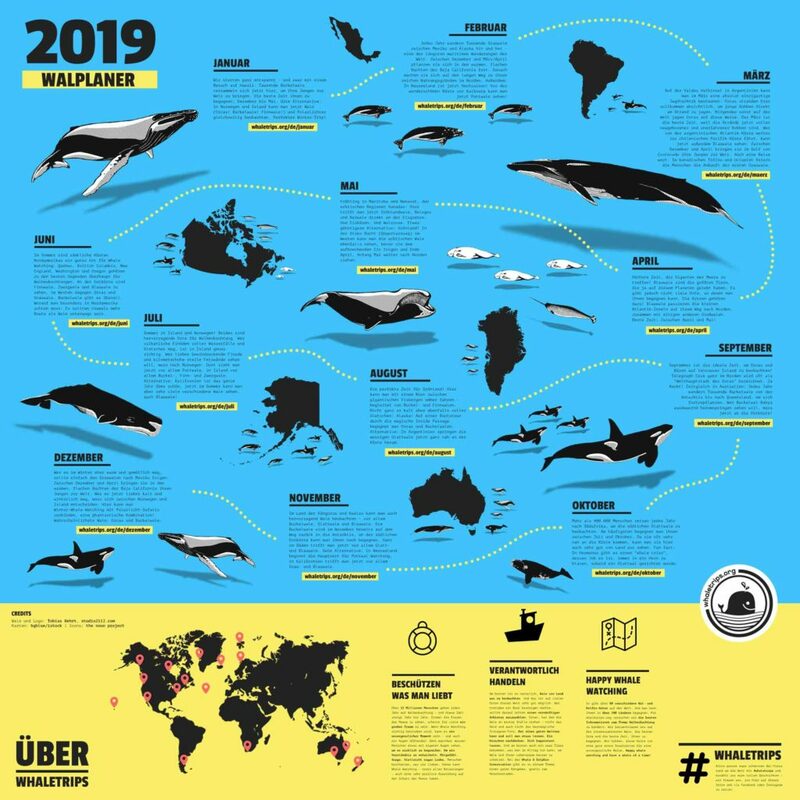 Other places for orca watching are Ireland, Scotland, Greenland or Faroe Islands (but, again, it’s not very likely to meet them there). In the South, Valdes Peninsula in Argentina is highly interesting, because in February and March transients come right to the beaches on the hunt for young seals and elephant seals that are trying their first attempts at swimming. 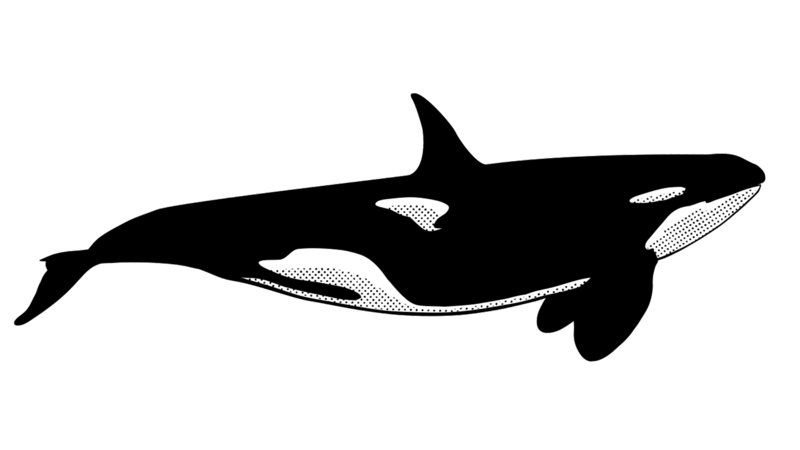 Moreover, orcas can be observed in the fjords of New Zealand’s southern island. The worldwide population of orcas is unknown. They probably aren’t seriously endangered as they have been spared from whaling to a high extent. A number of circa 50 000 individuals is estimated. But, a danger is posed at many places by the alarmingly increasing number of whale watching tourists, where too many providers are romping around in a space too small for all of them, leading to a significant disturbance of the animals.  If at only one harbor four, five or six whale watching providers can be found, then it is better to look for another place.